Today I had one of those days where most things went wrong or didn’t quite go according to plan. Not to the point where I want to curl up and cry with a bucket of melted chocolate and a spoon (admit it, you would!) No, today was filled with mini annoyances like not being able to find even one pair of trousers in the shop that wasn’t too long, or O falling asleep 15 minutes before it was time to leave to pick the kids up from school. I also had a kitchen disaster which I managed to turn around into something, actually two things, which were much more exciting than the original item! I have been trying to save a bit of money this week and empty our cupboards at the same time by using mostly only things that we already had in the house. So after entering a few random ingredients into Google (my favourite recipe book!) I came across this recipe for chocolate cornbread. I expect if you follow the recipe properly it would turn out lovely but I wanted to make muffins so I had something easier to pack in lunchboxes tomorrow and I had seen a few cornbread muffin recipes(not chocolate) so I figured it was doable. Maybe the muffins would have turned out great if I hadn’t used a mini muffin tray, without cases. And maybe they wouldn’t have stuck to the tray (and risen) if I had added the sugar and didn’t have to take the mixture back out of the pan to add the forgotten ingredient. I may or may not have added too much sugar in my attempt at pouring into the measuring cup over the mixing bowl. Perhaps I wouldn’t have missed out the sugar if I didn’t have a grumpy, clingy baby and rowdy kids hitting a balloon around in the background. So what did I do? After I got over the disappointment of flat muffins that were completely stuck to the pan and had a few quiet minutes while the kids were watching Glee, with the baby, I had an idea. I sliced off the top of each muffin putting them on a cooling rack. I then spooned out what was left over into a bowl. They were both left over from the cakes E&Ff made for O’s christening a few weeks ago. 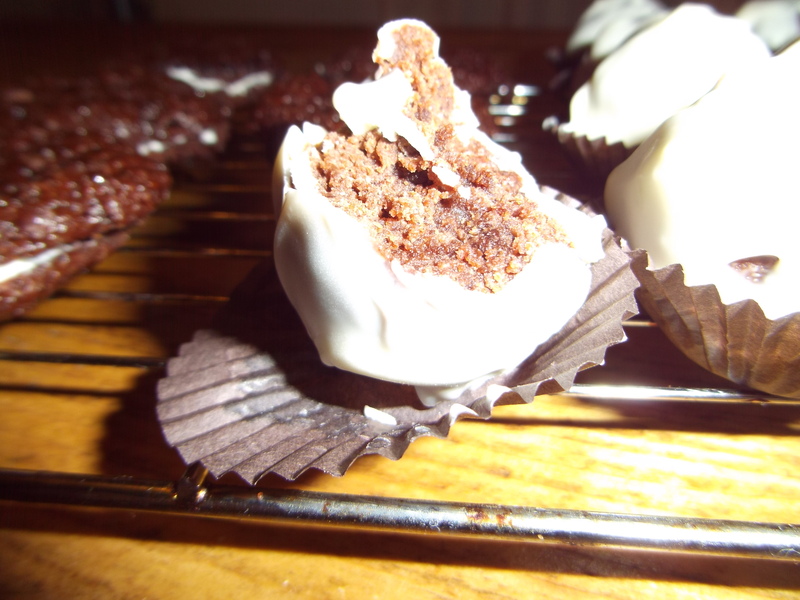 I spooned some of the icing into the cake crumbs mixing it all in well(it didn’t take much icing at all) and formed into truffle sized balls. I then dipped each one into some cooled melted chocolate and put each one onto a mini muffin case to set. With the lids I just spread one half with some of the icing and sandwiched them together. They had dried quite crispy so held their shape perfectly. In all I am very pleased with what we eventually got. The cake balls especially, are really scrummy! 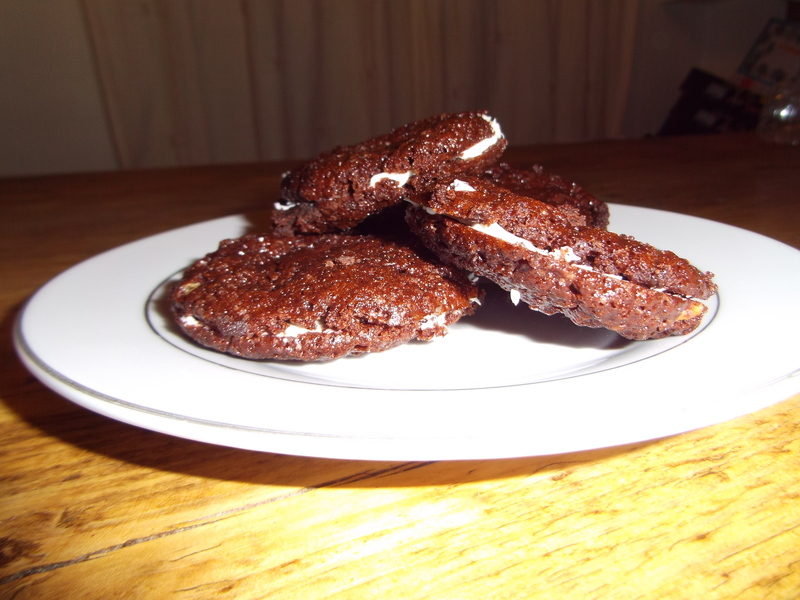 I may even consider making these again on purpose, perhaps in different flavours! I will definitely be making the chocolate cornbread again too. It tasted really nice and the texture was lovely. I added white chocolate chips just to give it that bit of an edge but it didn’t need it. I would also make it in a baking dish and follow the recipe to the letter lol. So this was supposed to be posted last week, but we had a mad time trying to finish decorating our bedroom before our new HUGE bed arrived and basically life just got in the way, but hey better late than never right? On wednesday night I was cooking our tea when the girls (we rarely if ever call them ‘the twins’) came in offering to help, stir and taste test of course. I must be honest here, our kitchen is very small and feels quite crowded when there are more people than just me in there so I will admit when I’m rushing and flustered I am often guilty of ushering the kids out and getting them to do boring things like setting the table and buttering bread instead. I do feel bad when I do this so on Wednesday E&Ff came in and as I was in no rush I let them stay. After a few questions about gravy, like why I use corn flour instead of normal flour, one of them (I’m afraid I can’t remember which) suggested that they should do all the cooking right from breakfast to supper the next day. I was quite taken aback by this offer but thought it was a great idea. They love cooking and can make simple meals and cakes. Expecting a barrage of question I was surprised to soon find myself alone again as they squirreled themselves away making plans, searching for recipes and writing a shopping list! Breakfast and lunch went swimmingly (lets be honest not much could have gone wrong there) and then it was time to take their list and buy the ingredients that we didn’t already have for tea. They did really well in the supermarket. They must have learnt something from my obsessive reading of labels and checked all the “price per 100g” on the bottoms of the price labels and picked up the types I usually buy *disclaimer here, I usually buy the value range on the majority of items but there are some sneaky things that they remembered. 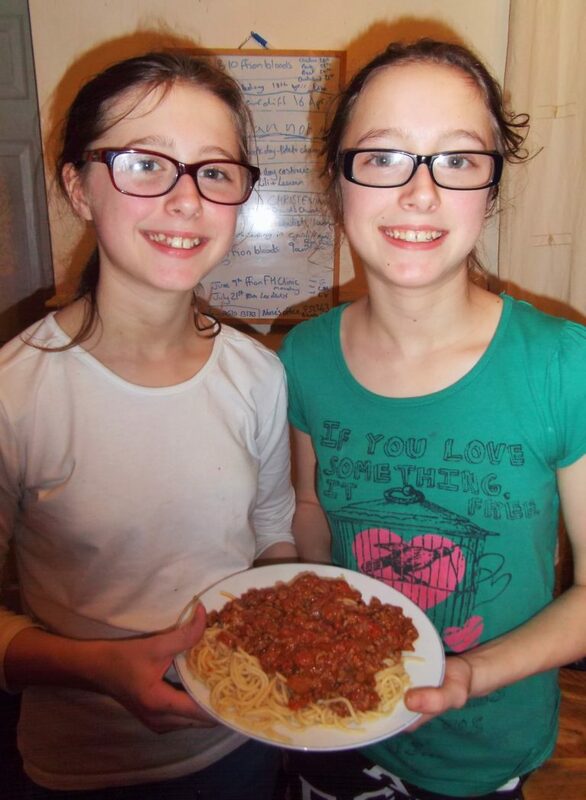 After buying some much needed school shoes and our groceries we made our way home and the girls set about following my spag bol recipe. They have peeled and chopped before but onions were a new one to them yet after a quick masterclass (don’t chop the root bit off) they were set. Many tears later, luckily from the onions not the loss of fingers, we had onions in the pan cooking. They made a fab team as they took it in turns stirring the pan and chopping the mushrooms. E gets a little freaked out by raw meat(this is something we are working on) so Ff quite happily put that in the pan and between the two of them managed to get the whole lot of ingredients in and bubbling. Next they started on the cupcakes, now this is where they got adventurous. They weren’t interested in using my boring recipe that they always make, they wanted something special and fair play they managed to find the most scrummy moist chocolate cake recipe I have ever tasted. This is the recipe they used here. Did they need my help? Apart from draining the spaghetti because our pans are sooooo big? Nope, they asked advice of course but I didn’t physically lift a finger! Did anything go wrong? Only some small issues, like the spaghetti was overcooked, but lets be honest that easy to do even if you have been cooking it for years. we ended up eating quite late, but I foresaw that and fed the baby something earlier. The only other issue was that the cupcake recipe called for only 15 minutes in the oven but they took 25 minutes and went a little flat because they had to open the oven to find that out. So did I learn anything from this? Yes! I learnt that my two 12 year olds are more capable than I give them credit for, they can be safe in the kitchen, follow recipes, go shopping in a supermarket not just the local shops. I also learnt that when I am stressed and rushing to do 13 things at once in the kitchen that I have two sous chefs willing to step in and do something. Just last night I had one keeping an eye on the fajita filling in the pan while the other was making the pancake mix at the table while I managed to console a screaming baby. 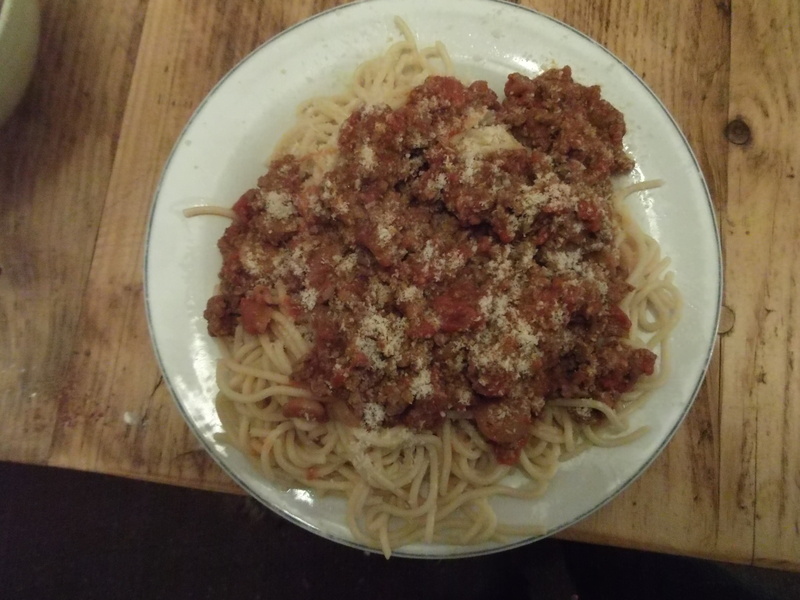 If you’d like my spaghetti Bolognese recipe I’d be happy to post it. It’s very simple, even 12 year old twins could follow it!